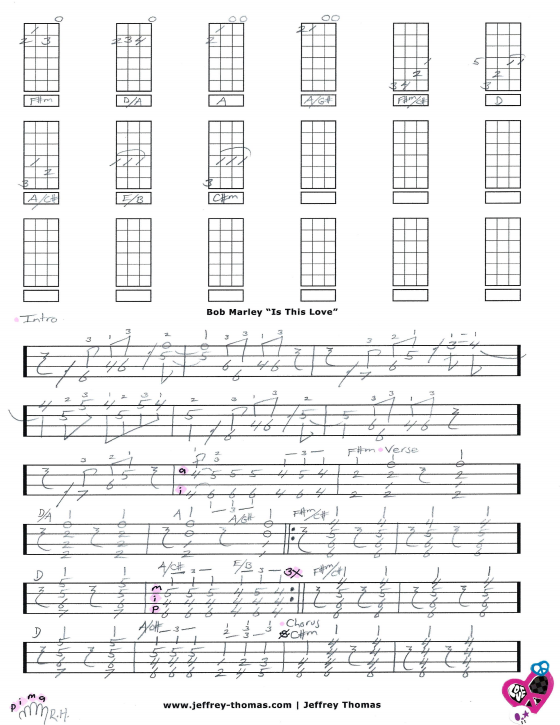 Bob Marley Is This Love ukulele tab. Learn to play this classic reggae tune on ukulele with my unique arrangement. I have all the signature licks from the intro guitar solo, fingerpicking details, chords with the reggae groove and song structure so you can play it like it is. This is a great sing along version and will sound very authentic. Here is another great reggae classic that is popular with my ukulele students. Want the full ukulele tab for free? Just send in your email address using the form provided. Looking for online reggae ukulele lessons? Fill out the Schedule A Free Lesson form to set up a free Skype ukulele lesson today. This is one of the most well known Bob Marley tunes and I hope you enjoy learning to play it! Find more online ukulele lessons on my tab, video and blog pages!